Lauren Goggins was teaching yoga in the Chicago Board of Trade building last year when she began to envision an opportunity to make an impact beyond the studio. Yoga was the means but in the end she wanted to enrich lives on a larger scale. Goggins imagined the studio transformed as Bottom Line Yoga (BLY), a peaceful respite where Chicago’s ambitious and overworked could find wellness and mindfulness. But her vision did not stop at the studio door or at 141 W. Jackson. She wanted to bring this mindful practice to companies throughout Chicago. And when she started talking, companies started listening. “I shared my goals and vision with Andy and Kevin Murphy (Burling Bank’s Chief Lending Officer) in December. They helped me solidify my business plan and outline my projections. Things moved quickly from there,” says Goggins. By January, financing was approved and studio renovations were well underway. At the end of February BLY was ready for a soft launch and by April it was in full launch mode. 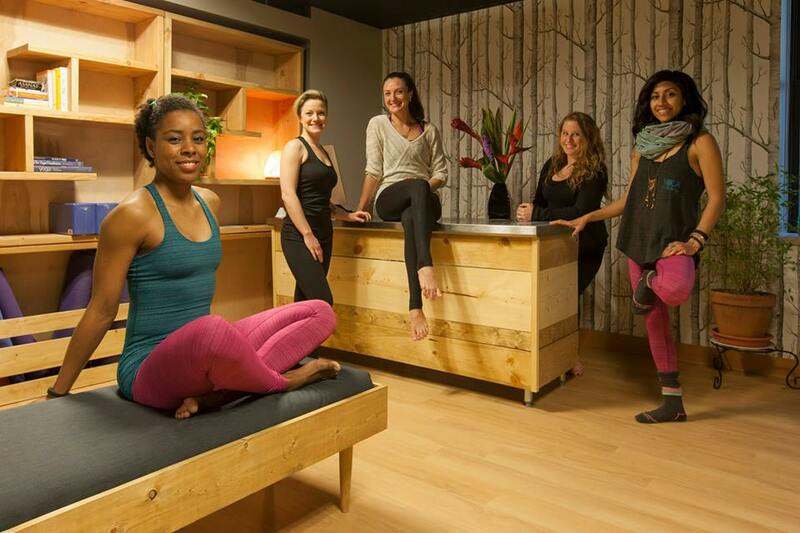 The staff at Bottom Line Yoga, including Lauren Goggins, second from left. Today, Bottom Line Yoga is seeing 20% month over month growth. The yoga studio is flourishing, but the studio is only part of the business. BLY also brings yoga classes to startups and midsized businesses with onsite classes and wellness programs. In fact, BLY is beta testing an online wellness tool to help HR managers schedule classes, track participation, secure waivers and manage their wellness programs. Bottom Line Yoga is located in the Chicago Board of Trade at 141 W. Jackson Blvd. Ste. 750. To find out more about classes and events, visit www.bottomlineyoga.com. Stephanie Izard, Taste of Accion 2014 Keynote Speaker & Bravo’s Top Chef winner, with the Burling Bank lending team. Accion helps communities grow by investing in entrepreneurs who build businesses and generate jobs in their neighborhoods. Through our support of events like Taste of Accion, as well as placing Accion client loans on the Bank’s portfolio, we have been able to broaden Burling Bank’s reach and improve our ability to service members of the community who may not yet qualify for a bank loan. Accion is a nonprofit that provides customized capital solutions, microlending and one-on-one coaching to underserved entrepreneurs. Their clients are neighborhood businesses — like bakeries, dry cleaners, and transportation services — that form the backbone of every community. As the largest nonprofit microfinance network in the U.S., Accion’s small loans help leverage big gains, generating local jobs and attracting more economic activity. With loans ranging from $500-$100,000, Accion provides the tools necessary for individuals to create and expand small businesses regardless of their backgrounds and other barriers to obtaining credit.